Figure 1: The position of Virgo I in the constellation of Virgo (left). 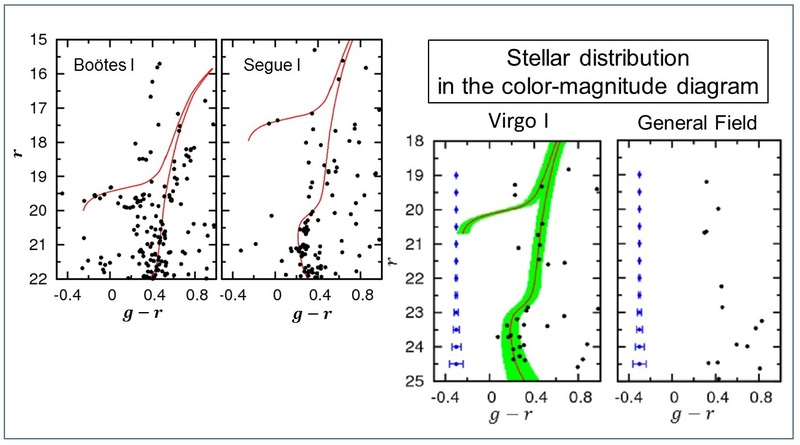 The right panel shows a density map of Virgo I’s member stars in a 0.1° x 0.1° area, based on the stars located inside the green zone in the colour-magnitude diagram of Virgo I shown in Figure 4 below. The colour range from blue -> white -> yellow -> red indicates increasing density. Illustration credit: Tohoku University/National Astronomical Observation of Japan. An international team led by researchers from Tohoku University has found an extremely faint dwarf satellite galaxy of the Milky Way. The team’s discovery is part of the ongoing Subaru Strategic Survey using Hyper Suprime-Cam. The satellite, named Virgo I, lies in the direction of the constellation Virgo. At the absolute magnitude of -0.8 in the optical waveband, it may well be the faintest satellite galaxy yet found. Its discovery suggests the presence of a large number of yet-undetected dwarf satellites in the halo of the Milky Way and provides important insights into galaxy formation through a hierarchical assembly of dark matter. Figure 2: Satellite galaxies associated with the Milky Way Galaxy. The blue squares represent the Large and Small Magellanic Clouds (LMC and SMC), while the circles are dwarf spheroidal galaxies. Click the illustration for a full-size version. Illustration credit: Tohoku University/NAOJ. Currently, some 50 satellite galaxies to the Milky Way have been identified. 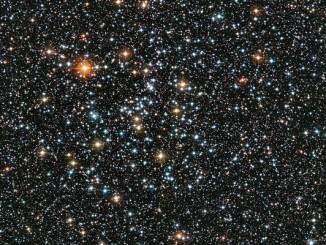 About 40 of them are faint and diffuse and belong to the category of so-called “dwarf spheroidal galaxies”. Many recently discovered dwarf galaxies, especially those seen in systematic photometric surveys such as the Sloan Digital Sky Survey (SDSS) and the Dark Energy Survey (DES) are very faint with absolute luminosity in the optical waveband below -8 magnitude. These are so-called “ultra-faint dwarf galaxies.” However, previous searches made use of telescopes with a diameter of 2.5 to 4 metres, so only satellites relatively close to the Sun or those with higher magnitudes were identified. Those that are more distant or faint ones in the halo of the Milky Way are yet to be detected. Figure 3: False-colour dwarf galaxy images taken with Subaru Telescope. Left: Leo II (V-band absolute magnitude MV = -11.9 mag). Middle: Boötes I (MV = -6.3 mag), where both images are taken with Suprime Cam. Right: HSC image of Virgo I (MV = -0.8 mag). Ultra-faint dwarf galaxies (Boötes I and Virgo I) are hard to detect from these images. Illustration credit: Tohoku University/NAOJ. The combination of the large 8.2-metre aperture of the Subaru Telescope and the large field-of-view Hyper Suprime-Cam (HSC) instrument is very powerful in this study. It enables an efficient search for very faint dwarf satellites over large areas of the sky. The first step in searching out a new dwarf galaxy is to identify an over density of stars in the sky, using photometric data. Next is to assess that the over dense appearance is not due to line-of-sight or accidental juxtapositions of unrelated dense fields, but is really a stellar system. The standard method for doing this is to look for a characteristic distribution of stars in the color-magnitude diagram (comparable to the Hertzsprung-Russell diagram in Figure 4 below). Stars in a general field shows no particular patterns in this diagram (right panel of Figure 4). Figure 4: Stars in the colour-magnitude diagram. Old stellar populations show a characteristic distribution along the curve seen in the diagram. From left to right: Boötes I, Segue I, Virgo I, and a general field outside Virgo I. The spatial distribution of the stars, which are located inside the green band for Virgo I, is shown in the right panel of Figure 1. Note that stars in a general field outside Virgo I (right panel) show no characteristic feature. llustration credit: Tohoku University/NAOJ. The faintest dwarf satellites identified so far was Segue I, discovered by SDSS (magnitude -1.5) and Cetus II in DES (magnitude 0.0). Cetus II is yet to be confirmed, as it is too compact as a galaxy. Virgo I may ultimately turn out to be the faintest one ever discovered. It lies at a distance of 280,000 light-years from the Sun, and such a remote galaxy with faint brightness has not been identified in previous surveys. 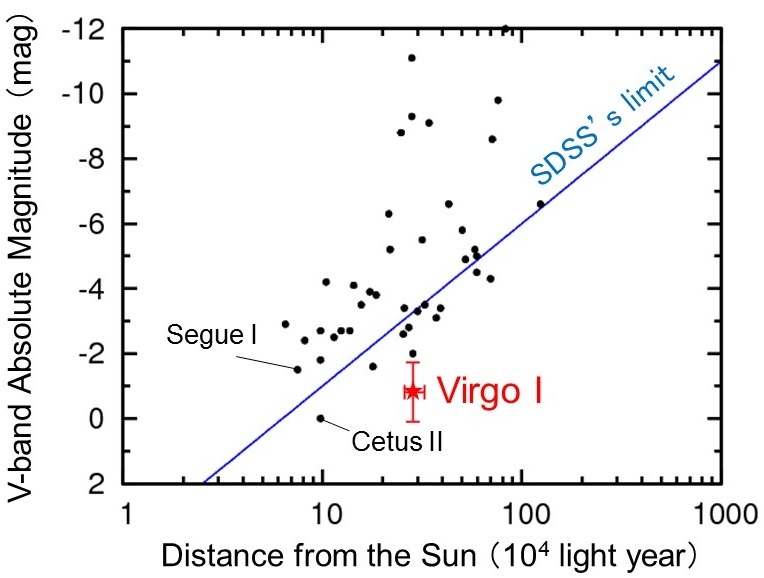 It is beyond the reach of SDSS, which has previously surveyed the same area in the direction of the constellation Virgo (Figure 5 below). Figure 5: The relation between the distance from the Sun and absolute magnitude in optical waveband for Milky Way satellites discovered so far. Virgo I is extremely faint and distant from the Sun and is beyond the reach of the Sloan Digital Sky Survey (SDSS). 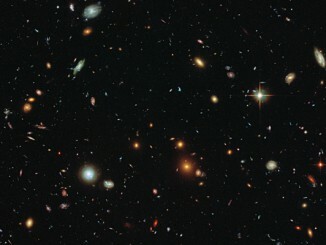 Except for Virgo I, the Dark Energy Survey (DES) mostly discovers those outside SDSS’s limit. llustration credit: Tohoku University/NAOJ. Formation of galaxies like the Milky Way is thought to proceed through the hierarchical assembly of dark matter, forming dark haloes, and through the subsequent infall of gas and star formation affected by gravity. Standard models of galaxy formation in the context of the so-called cold dark matter (CDM) theory predict the presence of hundreds of small dark haloes orbiting in a Milky Way-sized dark halo and a comparable number of luminous satellite companions. However, only tens of satellites have ever been identified. This falls well short of a theoretical predicted number, which is part of the so-called “missing satellite problem.” Astronomers may need to consider other types of dark matter than CDM or to invoke baryonic physics suppressing galaxy formation to explain the shortfall in the number of satellites. Another possibility is that they have seen only a fraction of all the satellites associated with the Milky Way due to various observational biases. The issue remains unsolved. One of the motivations for the Subaru Strategic Survey using HSC is to do increase observations in the search for Milky Way satellites. 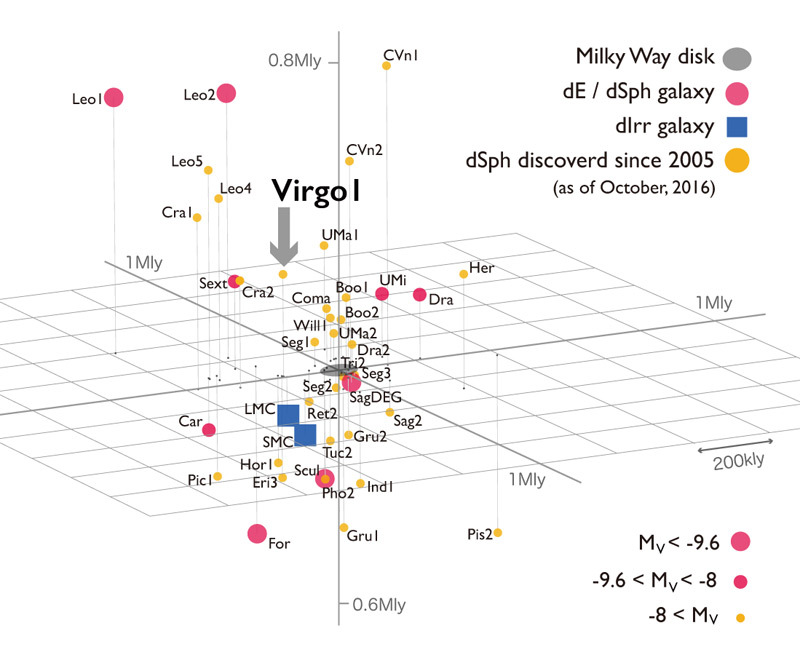 The early data from this survey is what led to the discovery of Virgo I. This program will continue to explore much wider areas of the sky and is expected to find more satellites like Virgo I. These tiny companions to be discovered in the near future may tell us much more about the history of the Milky Way’s formation. Most stars form within clusters and these clusters can be used by astronomers as laboratories to study how stars evolve and die. The cluster captured here by the Wide Field Imager (WFI) at ESO’s La Silla Observatory is known as IC 4651, and the stars born within it now display a wide variety of characteristics.